Drafted out of McNeese State as a tight end in the 17th and final round of the 1962 draft, Tom Sestak went on to become one of pro football’s great defensive linemen. At 6′ 4″ and a “lean” 272 pounds, Sestak used his speed, strength and agility to become the cornerstone of the Buffalo Bills 1964 and 1965 AFL Championship teams. 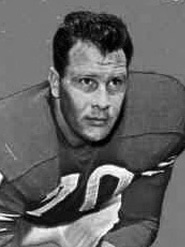 As a rookie, Sestak was selected to the AFL All-Star Team, and was named Defensive Rookie of the Year. He earned All-AFL honors for four consecutive years (1962-1965), before chronic knee injuries slowed, and eventually ended his career in 1968. He has been named to the AFL Hall of Fame, the Buffalo Bills Silver Anniversary Team, and to the first team All-Time AFL Team. Many experts consider him one of the greatest defensive linemen ever to play the game. Many people didn’t expect a lot when McNeese State tight end Tom Sestak was selected by the Buffalo Bills in the 17th and final round of the 1962 draft. However, it didn’t take long for Sestak to develop into an all-league defensive lineman, and gain recognition as one of pro football’s great tackles. Sestak was born on March 9,1936 in Gonzales, Texas. His paternal grandparents immigrated from Czechoslovakia, and his maternal grandparents, Peter and Emily Dylla, were of Polish heritage. Along with older brothers George and James, young Tom participated in a variety of sports, including football, basketball and track. James recalled that their working class parents were very supportive of the boys’ athletic activities. “They always told us, ‘Go out and play if you want to play,’” said James. 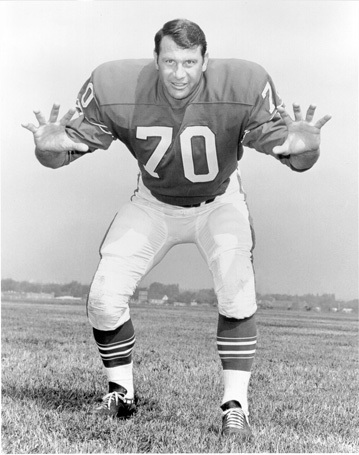 Over the next few years Sestak was the cornerstone of a top-rated Buffalo defense that took the Bills to the AFL championships in 1964 and 1965. In 1964 the Bills allowed just 913 yards rushing on 300 attempts during the regular season, a pro football record. The same defense registered a record fifty quarterback sacks. The 1964 defense also allowed only four touchdowns rushing all season, and started a string that would extend into the 1965 season of seventeen straight games without allowing an opponent to score a rushing touchdown. Buffalo defeated the high-scoring San Diego Chargers to win the AFL title both in 1964 and 1965, by scores of 20-7 and 23-0, respectively. Although Sestak probably hasn’t gotten the kind of recognition he deserves, he has received numerous honors over the years, including being named to the AFL Hall of Fame; the Bills Silver Anniversary Team; the Buffalo Bills Wall of Fame; the Greater Buffalo Sports Hall of Fame; the McNeese State Hall of Fame; and, the All-time AFL team. . Very popular in Buffalo, Sestak remained in the city after his retirement, and for a time ran a restaurant with former teammate Paul Maguire. He died of a heart attack in Buffalo on April 3, 1987 at the age of 51, leaving behind his wife, Patricia, and son, Tom. From humble beginnings Tom Sestak rose to pro football fame, and is truly deserving of induction into the National Polish American Sports Hall of Fame Class of 2007, in the Greats of the Past category.